It was a few hours after lunch, and as we walked around Tianzifang, I began to feel hungry again. What could I snack on? 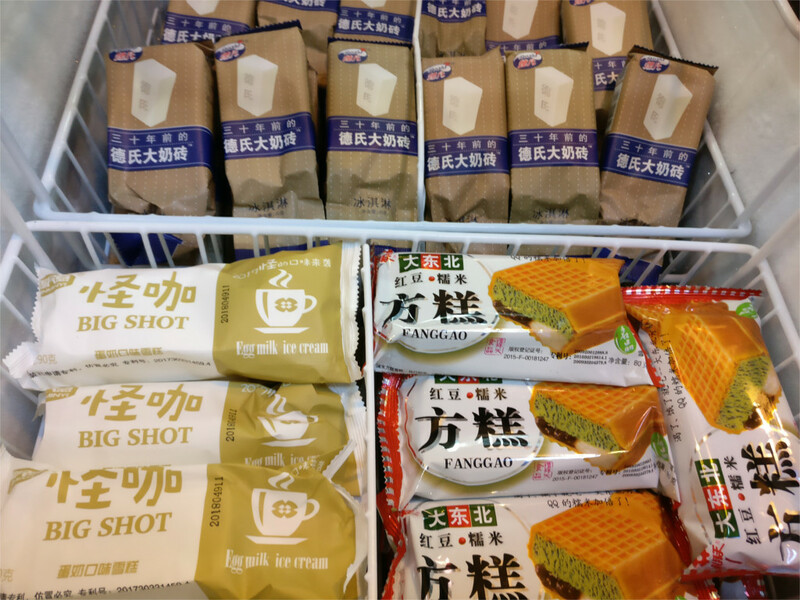 In China it is not hard to find snacks. We passed several kiosks selling skewered meat. That looked good, but did I want such a substantial snack at this time? I have a tendency to pass up perfectly good snacks until I get so hungry that I eat the first thing that I see. We passed a nice little kiosk (featured photo) advertising a wide variety of things that I could eat. The Family knows how bad I’m at selecting snacks, and drew my attention to the various steamed dumplings. Dumplings! Do I look like a Kung Fu Panda? My attention was on the interesting looking popsicles. And was that an ice cream freezer there? I looked in. I’m never able to pass up an opportunity to take photos of ice cream. I’d just barely recovered from a flu the previous evening, and I wasn’t going to take a chance on catching another throat infection. So I walked away. We passed a restaurant. It looked inviting. The Family knew that we didn’t have enough time to sit down at a restaurant and eat. She walked past. My hunger pangs were getting more severe by the minute, so I paused here. No menu hanging outside. I took a photo and walked on. As a tourist, perpetually on a short time-budget, I don’t seek out tranquility. So I’m all the more appreciative of it, especially when it comes on you inside the crowded and noisy Six Banyan Tree temple in Guangzhou, where people are busy exchanging money for spiritual satisfaction. I paused inside a hall with vast statues of various Buddhas and saw this scene. The image of the world’s most famous ascetic juxtaposed with a priest waiting patiently for his next customer was something one could not pass up. “What did you do while I slept?” I asked The Family when I finally gave up trying to sleep through my flu. “This and that. 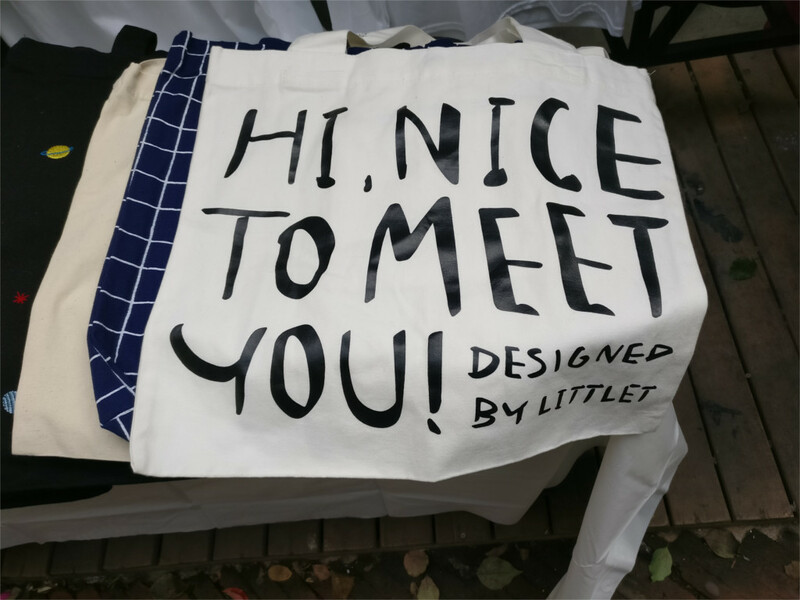 I went shopping and I took lots of photos,” she said. We went out together in the late afternoon, walking again through the Liwan district. She showed me the photos when we sat down. She’d taken the trouble to stop in front of each of the bronze statues that the city has installed on Shangxiajiu pedestrian street and photographed it. We’d both admired these pieces of public art which celebrate the heydays of Guangzhou, the 1920s and 30s.These bronzes are evidence of China’s renewed fascination with the life of those times. I had very few photos of them, and, in fact, The Family had discovered ones that I’d not even seen. The plaques below the pedestals did not give us any information on the dates of installation or the names of artists, but, of course, we do not read Chinese. Later we searched on the web but couldn’t find any information either. Tianzifeng is a tourist magnet which we’d missed when we first visited Shanghai a few years ago. 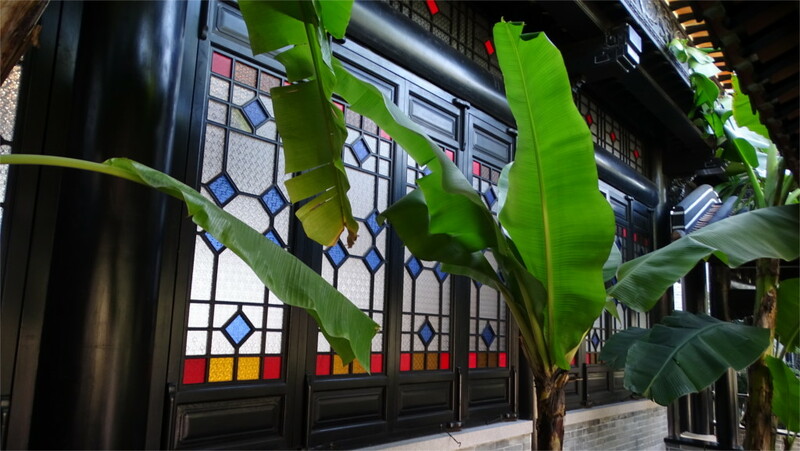 Tianzifeng is famous for preserving a piece of Shanghai’s architectural heritage by changing its usage. In the second half of the 19th century Shanghai and several other concessionary port towns of China developed neighbourhoods (called lilong) with two or three story brick houses. This style of architecture is called Shikumen. At one time over half the houses in Shanghai were built in this style. The construction boom of the early part of this century began to replace Shikumen style neighbourhoods with modern high-rise apartments. 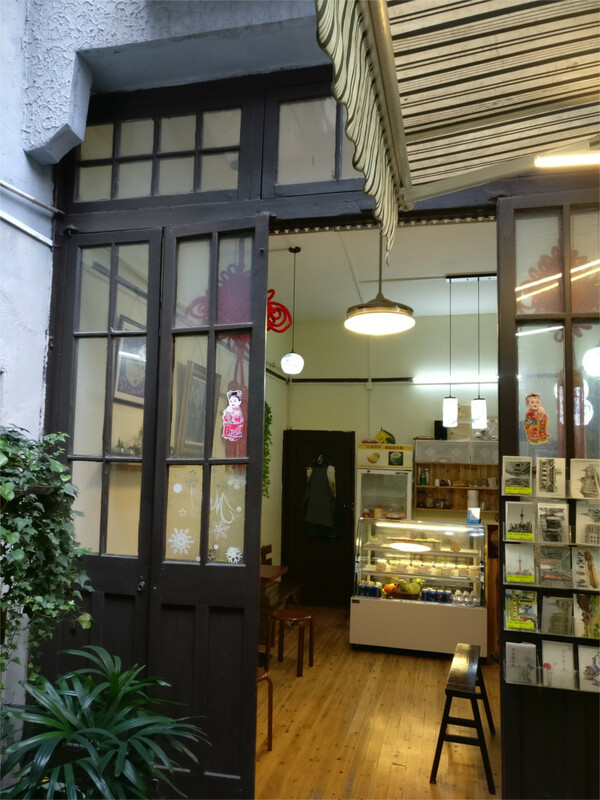 The area called Xintiandi was actually torn down, and then in a belated recognition of the historical importance of this kind of architecture, was rebuilt in the old style. 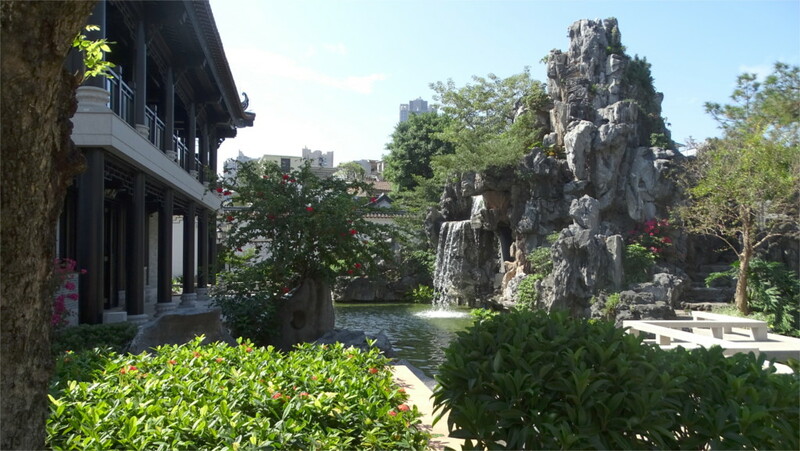 In Tianzifeng (literally, the lane=fang of the emperor=Tianzi), on the other hand, the old neighbourhoods were retained. This is obvious when you enter the narrow lanes which now hold clothes, design, and jewellery shops, along with an equal number of restaurants. There were crowds, but very few were foreigners. We were happy to see that not all the houses had become shops. 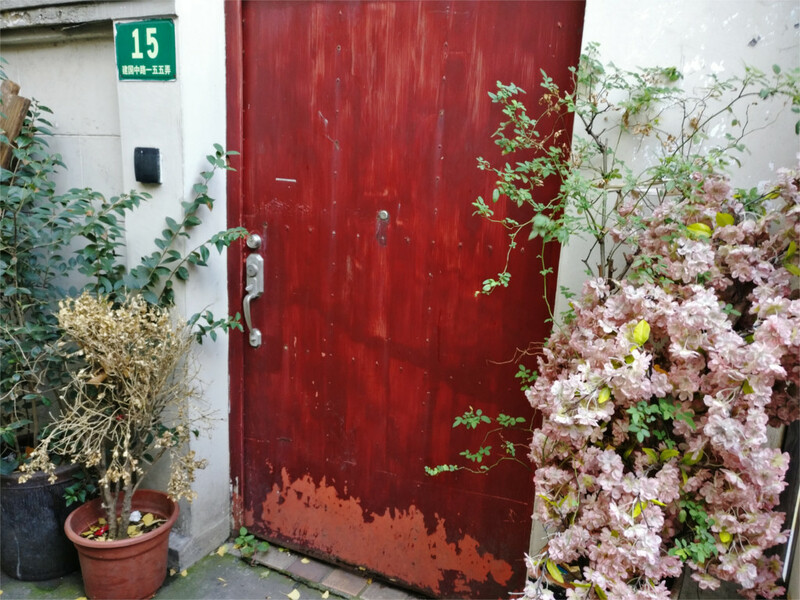 This will never again be the organic neighbourhoods of the kind that we’d seen in Beijing’s hutongs, or the Li Wan district of Guangzhou, but there are a substantial number of people living here with doors firmly closed to tourists. The high walls and strong doors are the origin of the the word shiku men (stone gate). When this style was new, the walls jealously guarding their sliver of garden would have been much talked about. If you are wondering why I don’t have the full door in the frame in the photo above, this photo shows you the lane in which it stands. 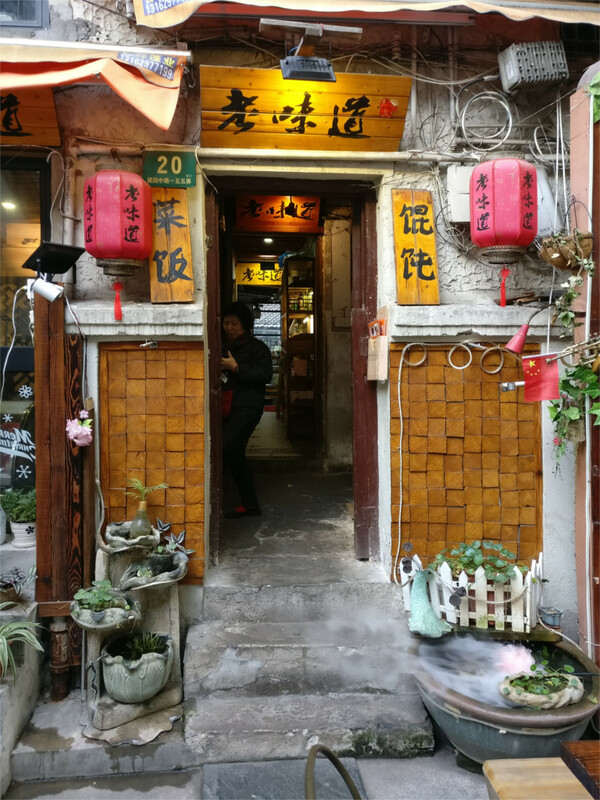 These narrow streets make up the lilongs of old Shanghai. The lane was not wide enough for me to stand back and get the whole door into the frame, although my phone camera does have a wide angle. 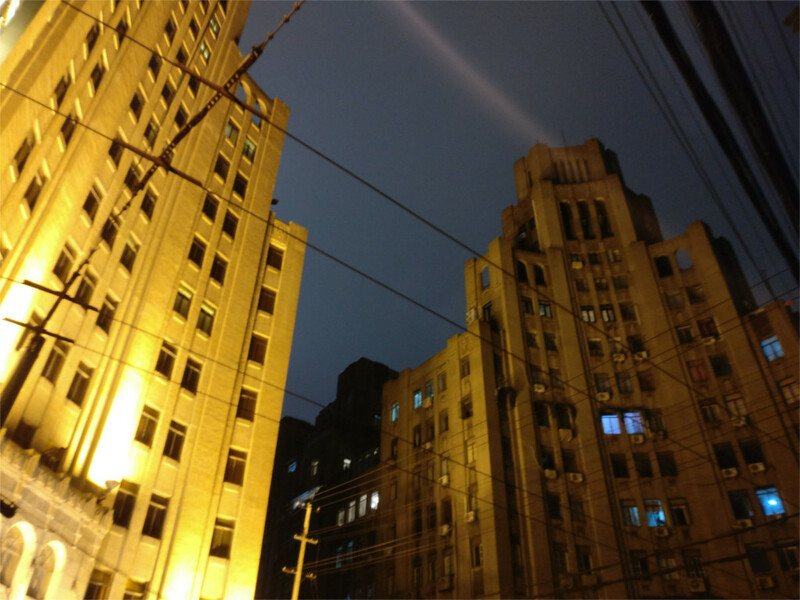 We walked out of the lanes into the high-rise neighbourhoods of modern Shanghai. Right opposite the exit was a large mall with three stories of food stalls near the street level, and other shops above. Life is changing rapidly in China. I love the meaningless phrases that the Chinese put on their tees. That red tee (hong cha, to mistranslate a pun) in the featured photo was a word salad: full of the taste of English without too many of the calories. 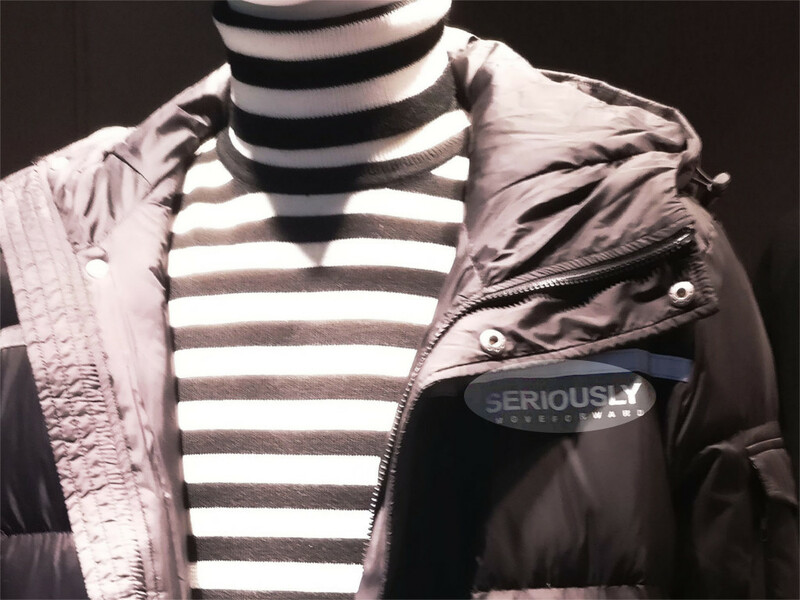 When I took a photo of this jacket in a shop’s display the salesgirl was very annoyed with me. Photos of jackets? Seriously? 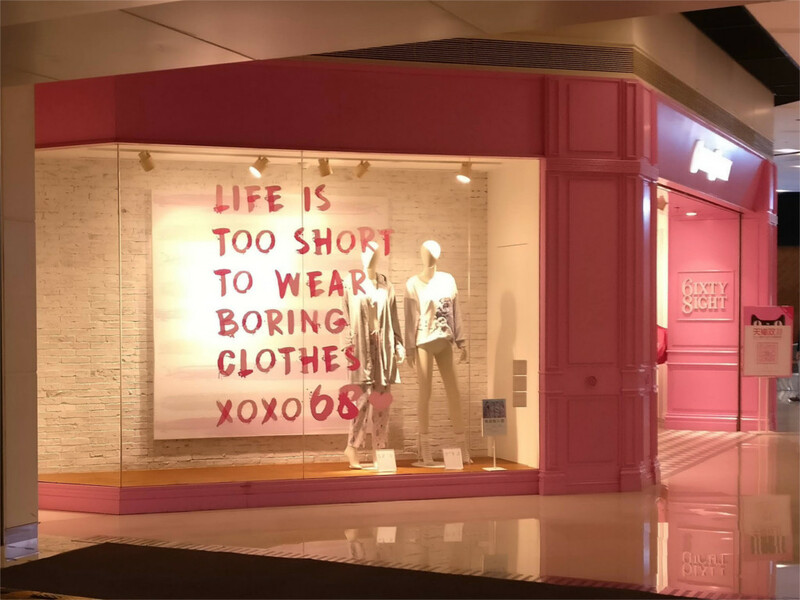 This shop window was visible from inside a metro station. Truly, the words of the prophets are written on the subway walls. And you too. 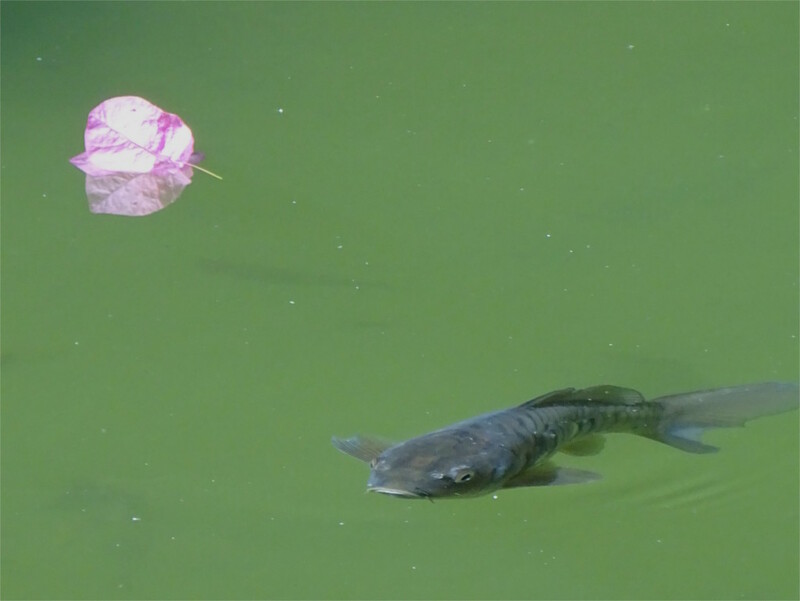 Thanks for all the fish, by the way. 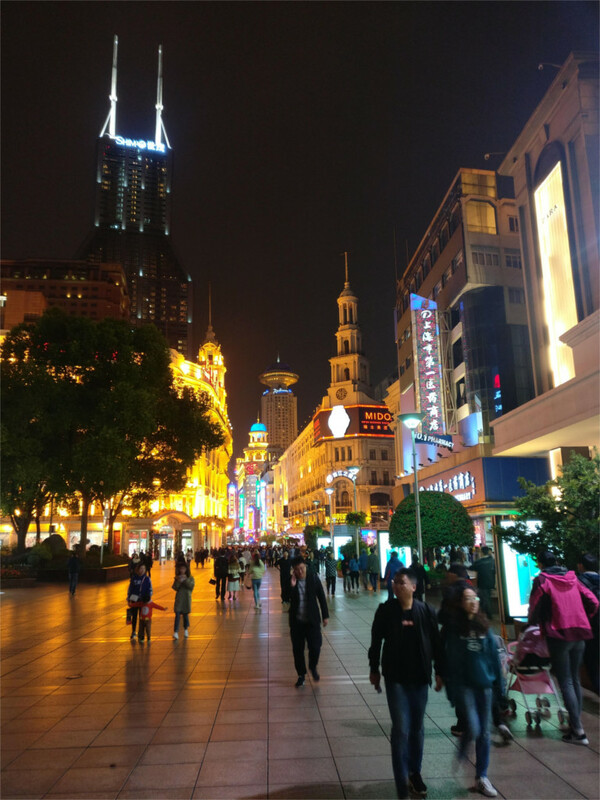 Strolling along the pedestrian section of Nanjing Street at night, The Family and I came across public nostalgia for Shanghai’s Belle Epoque. The 1920s and 30s were a gilded age. In this new gilded age of Shanghai, it seems that nostalgia for that century old era is rife. The photo shoot in the video was street theatre, very deliberate, drawing an appreciative audience. I was happy to do my bit of ambush photography. With a boom in 1930s nostalgia, China is adapting. Some of this adaptation is dusting off forgotten landmarks, some is redecorating things. Sometimes for an amateur like me it is hard to tell the difference. The Family and I walked down Hankou Road in Shanghai, and came to a building with a facade which confused me a little. If there had been no balconies here, I would have immediately thought of it as an Art Deco building. But the balconies break the clean lines which I always associate with this style. The Family said “We can take a closer look, if you want.” So we walked into the lobby of the hotel. The port of Hankou stands on the Yangtze river and has lovely Art Deco buildings. 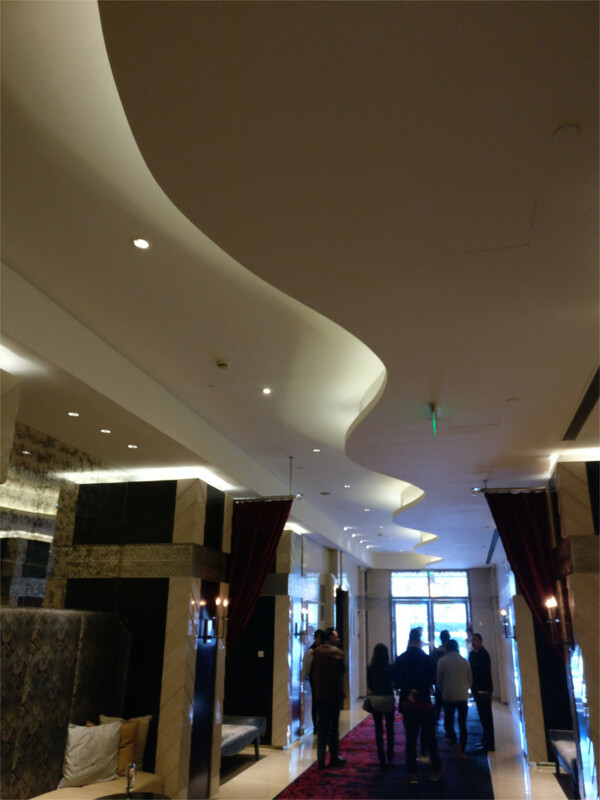 Was Hotel Yangtze on Hankou Road an Art Deco building? 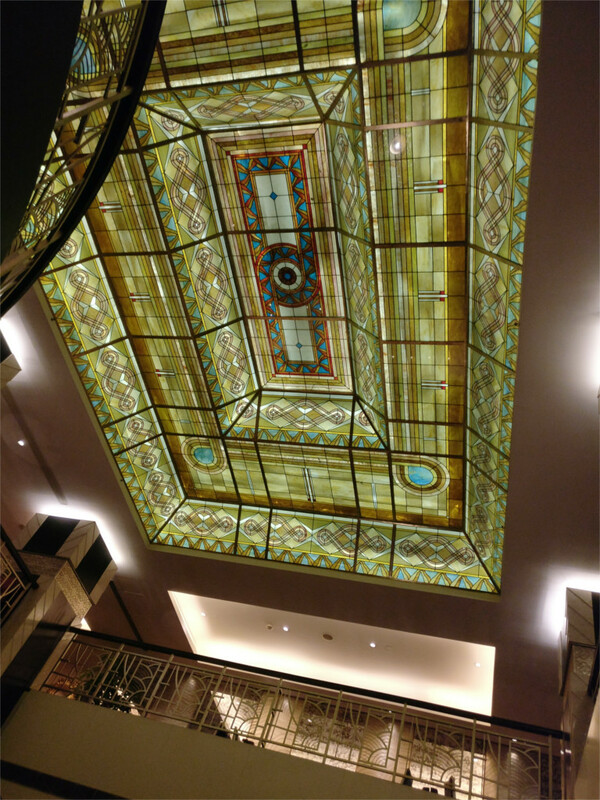 The illuminated glass ceiling of the lobby confused me. It could be Art Deco, but the lobby looked cramped. Most Art Deco buildings somehow manage to look airy and grand, no matter how small a space they occupy. The staircase came down in a nice sweep, but again managed to look cramped. The corridor between the lobby and the entrance could have jumped out of a 21st century re-imagination of a Flash Gordon movie. But was it real? The circumstantial evidence was too overwhelming. I noted down the name of the architect, Li Pan, and thought I would look it up later. I did, and I couldn’t find him listed among the names of the architects involved in Shanghai’s Belle Epoque. Nor did old guidebooks list this property as something to watch out for. But of course, hotels change names. Even street addresses change: roads are renamed, buildings renumbered. The problem seemed unsettled. Eventually I found a Li Pan: an architect practicing today, also called Paul Lin Pan. And that opened a key. 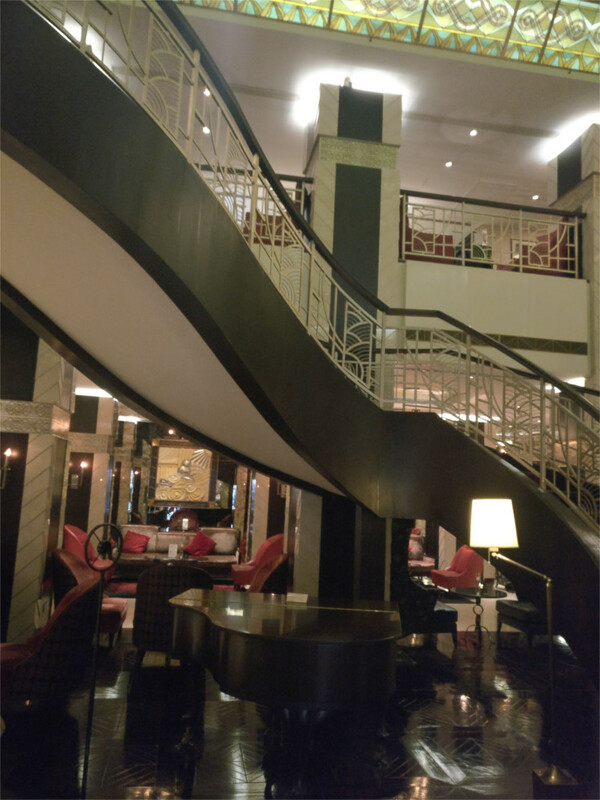 According to the somewhat confused records that I have found, the hotel was designed by a Li Pan in the Art Deco style and completed in 1934. However the renovation in 2007, also seems to have been done by a Li Pan, and it has been panned for adding extra touches, like the “zig-zag lines” on the facade, which weren’t there in the original. I wonder whether this confusion of architects has something to do with the Chinese cultural attitude to authenticity (I have been confused by this again and again). Comparing a picture in an old postcard with the new facade shows at least this difference. So this falls somewhere in the spectrum between real and fake, not far from real Art Deco. The famous travel writer, Douglas Adams, wrote “The History of every major Galactic Civilization tends to pass through three distinct and recognizable phases, those of Survival, Inquiry and Sophistication, otherwise known as the How, Why, and Where phases. For instance, the first phase is characterized by the question ‘How can we eat?’ the second by the question ‘Why do we eat?’ and the third by the question ‘Where shall we have lunch?” in the second volume of his definitive book, A Hitchhiker’s Guide to the Galaxy. After a day spent munching on little snacks I was on the How stage of development. The Family had progressed to Where. There is a huge food store on the Nanjing Road pedestrian shopping street which we’ve wandered in and out of. Some of the counters there are extremely popular, and I’ve tried out biscuits and cakes from their many bakery counters. But some of the things on display raise questions that Douglas Adams never dreamed of, for example “What is it?” Or “What? Is that something you eat?” The dark things in the photo above looked like cocoons. 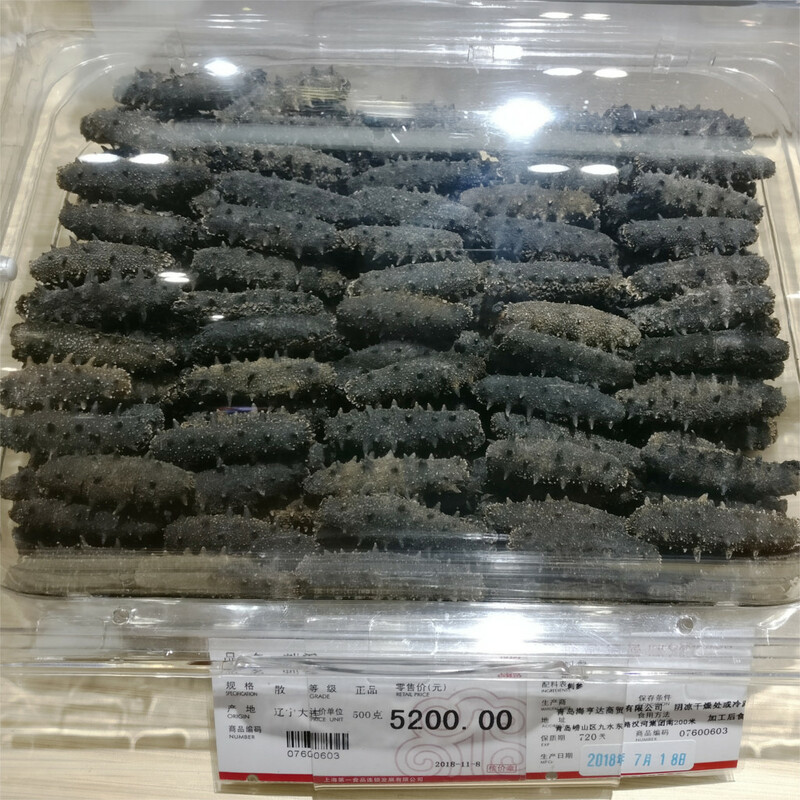 I’ve eaten silkworm before, and found it quite nice, with a mild nutty taste. Is that what this is? I had no idea. It was clearly expensive, though. Not something to be trifled with if you didn’t know exactly what to do with it. 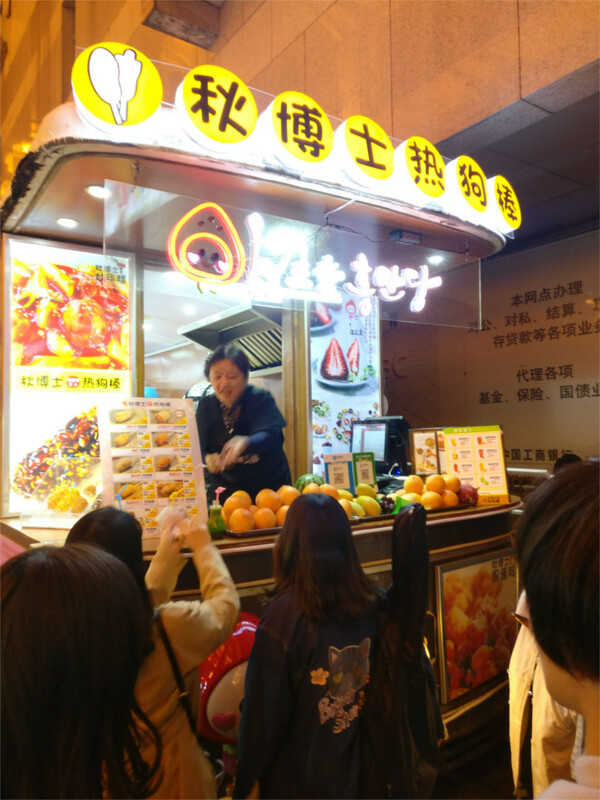 I was full enough that I wouldn’t have minded trying to order a glass of freshly pressed orange juice from the truck parked off Nanjing Road. I say trying, because it is always a little difficult to order if there is no menu. However, this being Nanjing Road, I was pretty certain that someone there would be able to translate my English. There was also a menu, so I could have pointed if necessary. The truck was doing roaring business, and I looked longingly at it. We had planned out our dinners and lunches very rigorously in Guangzhou, but had forgotten to plan for our single dinner in Shanghai. 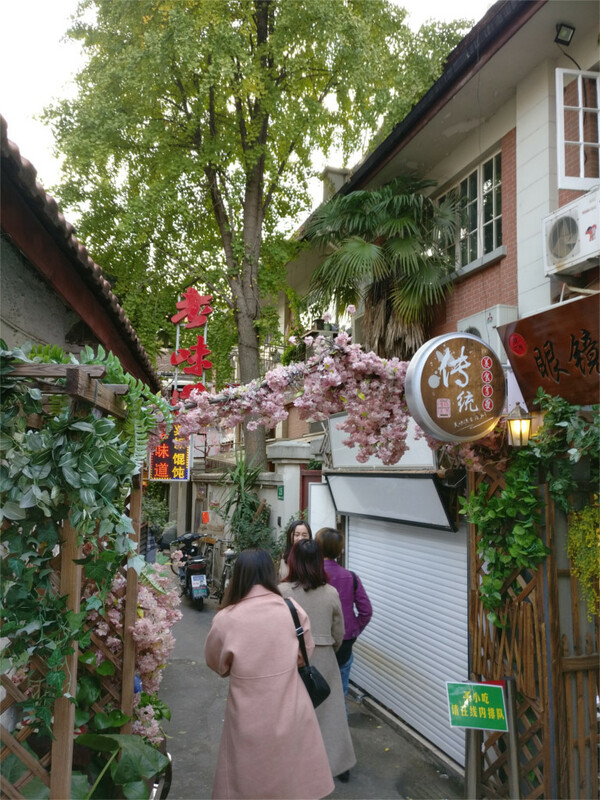 The best idea that I could come up with was to walk around the maze of streets just north of Renmin Park and choose a place by looking at it. This could be interesting: the featured photo shows a place which was enormously popular. But this queue was too long for us. We walked through lanes filled with restaurants which looked bright and inviting while The Family spooled through her decision tree. The result was quite interesting and nice. The lights came on all along the Bund at precisely 6 in the evening. 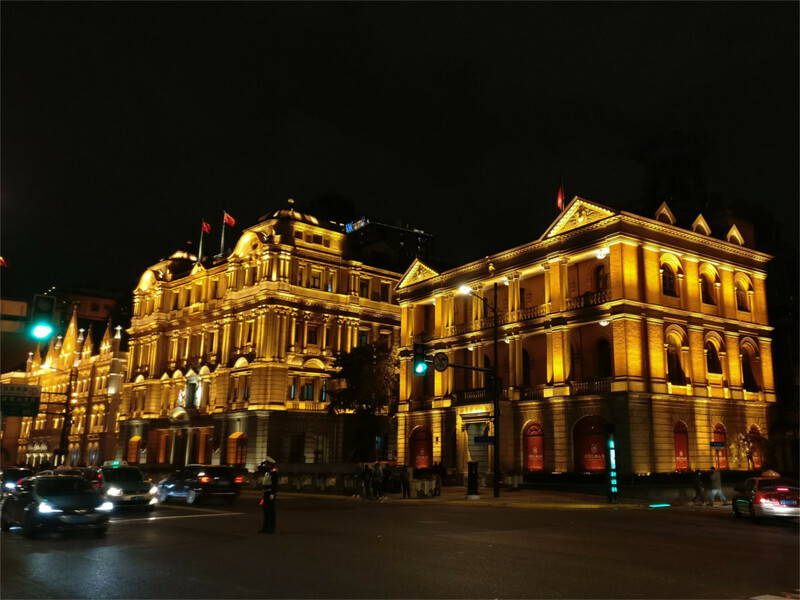 The western bank of the Huangpu turned into a bright gold colour which suits all the banks which look out on the river. The Family gasped, and I think a ripple ran through the crowd as everyone turned from looking across the river towards Pudong to behind them. The Family loves this area; ever since I’d proposed a trip to China, she had her heart set on an evening strolling along the Bund. It’s worthwhile coming by early. 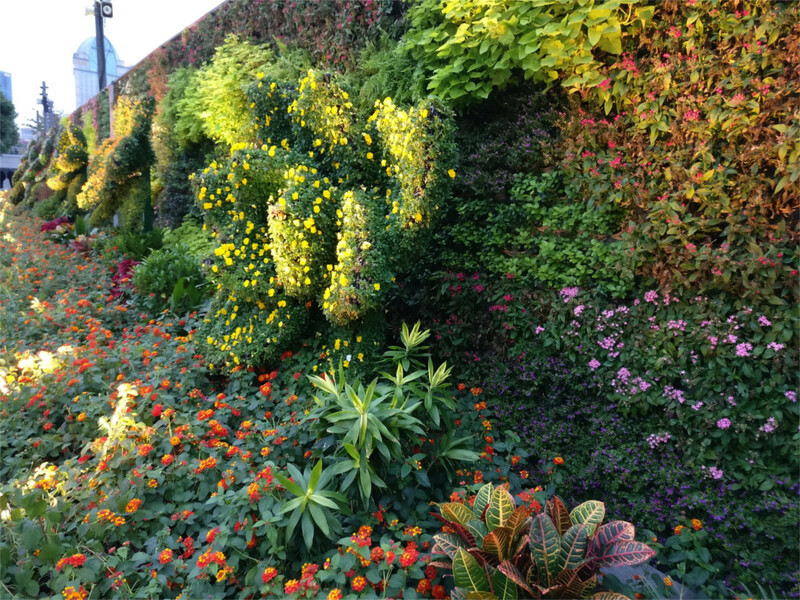 We’d crossed Zhongshan East Road just before the sun set and seen the high walls of the bund covered in a vertical garden. The Bund is a flood control wall (as the Hindi word indicates) built in the 19th century at the time that Mumbai’s merchants, Victor Sassoon, the 3rd Baronet of Bombay, and others, settled north of the Chinese town and poured money into developing this new city. This is a history that is slowly fading from the memories of both sides of the Himalayas, but deserves to be remembered. 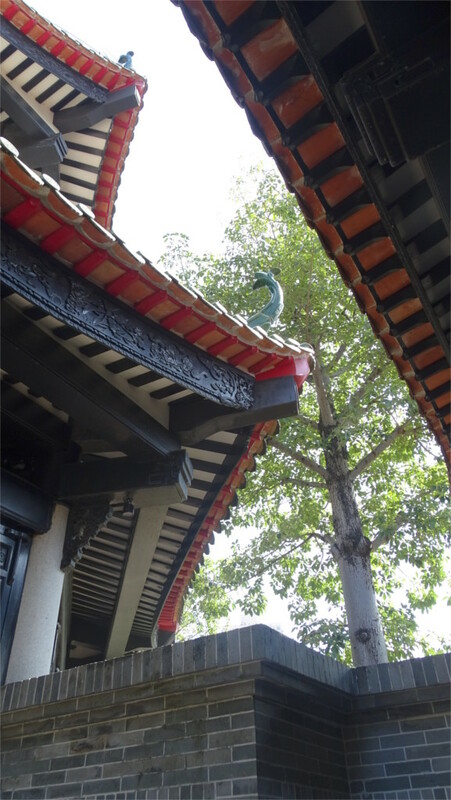 The green coloured pyramidal roof that you see in the featured photo belongs to the Peace Hotel, formerly Victor Sassoon’s flagship Cathay Hotel. The domed building in that photo (at the extreme left) is the Bank of Taiwan. This stands on Jiujiang Road. Across the road (The nearest building in the photo above) is the Forex trading center, and then the large frontage of the Bank of Shanghai. A few more banks down there is an area full of nice bars with good views. Across the river lights had slowly come on in the modern high-rises of Pudong. Unlike the Bund, these lights are not coordinated. This is a delightful sight, which The Family and I enjoy every time we see it. 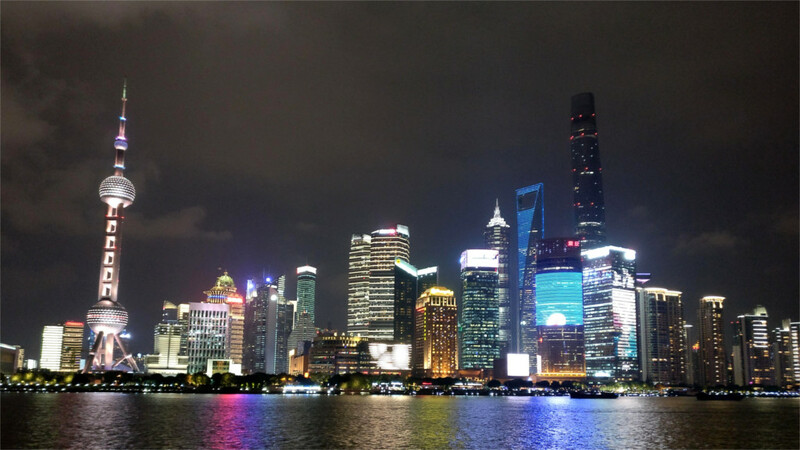 The 470 meter high bulb-on-a-stick of the Pearl Tower, the dark bulk of Shanghai Tower (at 632 meters, China’s tallest, and the second highest building in the world), and the bottle-opener shape of the 492 meter tall Shanghai World Financial Center dominate the view. We didn’t want to cross over to that side today. After chatting with groups of Indian tourists who needed someone to take their photos against this iconic background, we climbed down from the Bund. We walked west along Fuzhou Road for a couple of blocks. This is an interesting part of Shanghai. 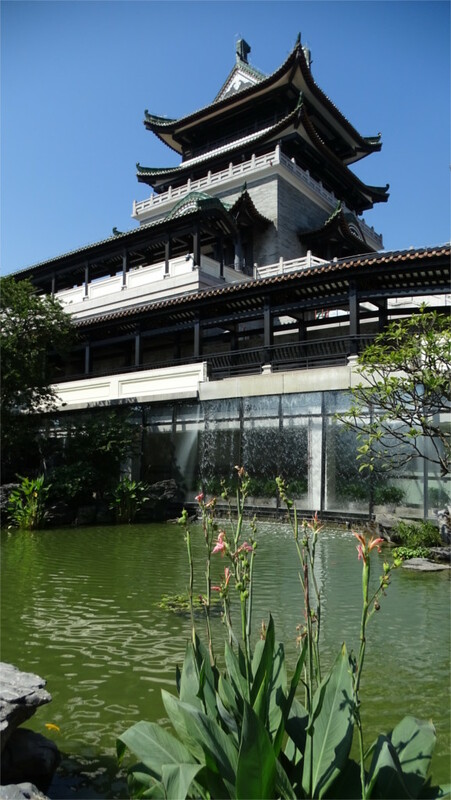 Most of the buildings date from the late 19th century until the Japanese invasion. It is an urban historian’s delight, with beautiful buildings and interesting histories. Unfortunately, Shanghai’s Museum of Urban Planning does not say much about this area. I would love to walk around this part of the city with a detailed guidebook of a kind that does not yet exist. It would certainly be as interesting as walking around Manhattan south of the 59th street. At the crossing of Jiangxi middle road and Fuzhou Road we came to this interesting set of buildings openings into a circle. We took a few photos and walked north. Two blocks northwards is East Nanjing Road, the spectacular pedestrian shopping street which is usually so crowded; the lack of crowds indicated peak dinner time. 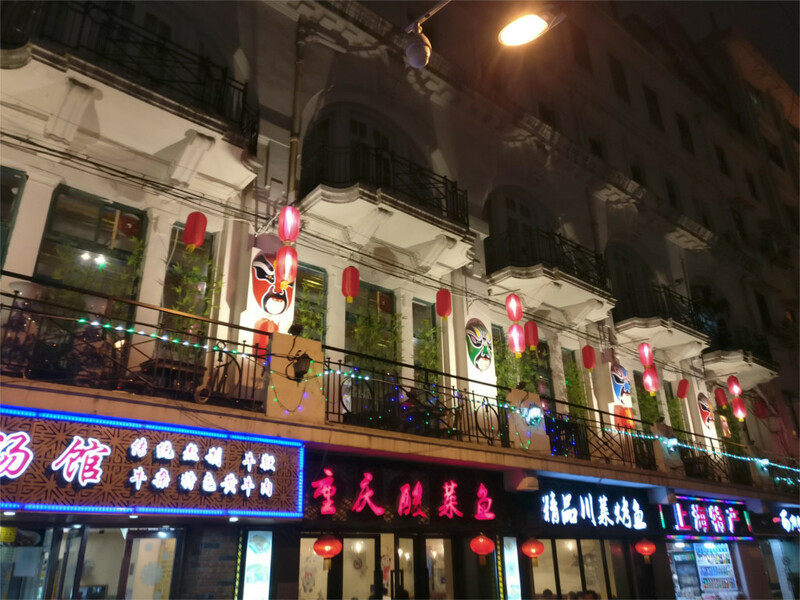 We walked away from the Bund towards the warren of streets with interesting restaurants closer to Renmin Park. Ahead of us, the double spires of Shinmao International Plaza rose almost a hundred meters from the roof of the building to touch the 333 meter mark. This would be tall anywhere else, but in Shanghai it is an also-ran.